applied for on July 23, 1896. Granted on September 15, 1896. Knutsen’s first instrument is labeled a "guitar" – in later ads he would refer to it generally as the "One-Arm Guitar" or the "One-Arm Harp Guitar" (though this model never had additional bass strings), and specifically as the "Short Arm Guitar." The illustration conforms to the known "1896 Patent-Style" instruments, except for the unique soundholes, which are clearly specified in the text: "a crescent," and "two approximately heart-shaped figures." So far, only one instrument with these specific soundholes is known (HGP11); all others have a standard round hole on the arm and body. applied for on May 17, 1897. Granted on February 15, 1898. Knutsen labeled his second instrument a "harp-guitar frame," and it is indeed a true harp guitar (though for some reason, he also made this model without extra basses). He also referred to this one in ads generally as the "One-Arm Guitar" or the "One-Arm Harp Guitar," and specifically as "Harp Shape, 6, 9 or 11-string Guitar." This time, the soundholes are even more clearly specified: on the body "two hearts, with their spices turned outward, and centrally below them is a five-pointed star" and for the arm "a crescent bisected by a diamond" (one can just make out the diamond). Mind you, this is not a "model option," but is specifically delineated as part of the patent. Be that as it may, no examples are known; all specimens so far have typical round soundholes. Other than that, the illustration accurately depicts the standard 5-bass "1898 Patent-Style" harp guitar – including the strange bass nut, and the bizarre configuration of both the bass and neck tuners. 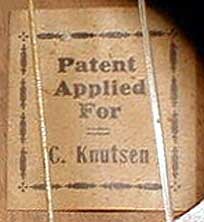 The dating of this patent is interesting: labels indicate that Knutsen was making this model earlier, concurrent with the 1896 model (that model lasted to about 1900). He was also likely already making (or just about to) his new Symphony Harp Guitar model by the time this patent was issued. Things get even more interesting with the English patents, which were simultaneously filed and accepted within the nine months of the second American patent acceptance process. applied for on August 19, 1897. Accepted on November 27, 1897. The first one is pretty straight forward. The sidebar states that the drawing is a "reproduction of the Original" - and it seems to be a near-exact copy of the American illustration (but re-drawn). Knutsen uses the same words and even more detail to again describe the soundholes. Of particular interest is that, at the time of the filing in August 1897, Knutsen refers to himself, not yet as a guitar maker, but as a "Plasterer." The second English patent is interesting for a couple of reasons. First and most important, Knutsen now shares his invention with one Charles Tinsley, also of Port Townsend! I have never heard this name before, and haven't yet found any information on him (if someone does, please let me know). He was not involved in the first "short-arm" guitar patent, and he wasn't listed on the U.S. Patent, which was filed exactly three months before this one was in England. Was he involved all along, and the two men hashed out some differences in the intervening three months? Or did Tinsley suggest a modification in that brief time? The only real difference is the simpler sub-bass extension for 3 strings, instead of 5. As is seen in the Harp Guitars gallery, Knutsen made this "full-arm" harp guitar with 0, 2, 3 or 5 sub-bass strings (under the same patent). Other changes: The word "frame" is dropped and the design is now called simply a "harp-guitar." There is a new illustration, badly drawn and copied either from a different illustration or photograph of the 9-string (3 sub-bass) version of the "1898 Patent Style." Interestingly, it looks like the draftsman was trying to draw an Otto Anderson-style carved bridge! Also note the scalloped fingerboard end on both instruments (a known Anderson feature), but not on the second American patent. The soundholes are identical to those in the American version (with the diamond-in-crescent clearly visible), but this time are not described. Still - it's fascinating that we have four patents covering almost a two-year period, all picturing (and three describing in detail) the distinctive soundholes - yet only one example is known! It'll be great to find some existing specimens someday. These occurred at the same time as the English patents. I need a volunteer to track these down – any takers? The two above are the only confirmed patents of Chris Knutsen. There are a number of ca. 1909-1914 instruments (5 Hawaiian guitars and 4 ukes) with a "Patent Applied For" label. Then there are the more common "New Hawaiian Family" labels, used on many instruments from possibly 1914 into the 'twenties. 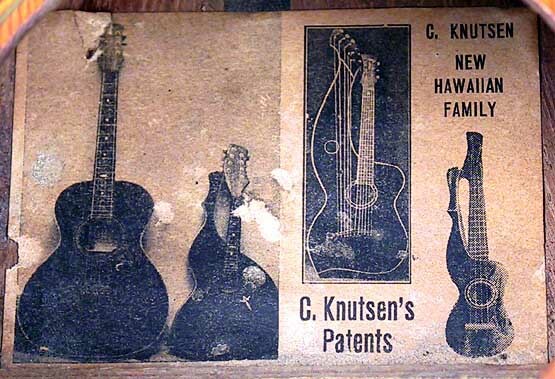 These boldly state "C. Knutsen's Patents" - presumably referring to the four different instruments pictured. Tom Noe and I believe that these various Design patents were applied for but never granted. The interesting story of the 1898 Hagberg patent (# 29,666) is told in From Harp Guitars to the New Hawaiian Family by Noe & Most. The hollow arm on this Knutsen rip-off actually had an opening like a trumpet. Apparently, none were made, as it was a patent infringement. Too bad - would've been something to see! Click here for Patent text. This intriguing instrument is patent # 518,775 from April 24, 1894 - two years before Knutsen's first patent. Invented by a John B. Birrer of Newton, Kansas, this hollow-armed guitar now supercedes Knutsen's "One-Arm Guitar" as the first of this concept in America. Note the similarity of the hollow head (with 2nd soundhole) and tuners to those of Schenck's instruments on the Similar Instruments page. Another patent story told in the Noe/Most book is that of the Ernest Livermore mandolin. After signing as a Knutsen patent witness, Livermore immediately stole Knutsen's hollow-arm extension idea - applying it (pretty badly) to a bowl-back mandolin and violin. He clearly wasn't an instrument builder, and apparently never bothered to have any of the instruments made (or, rather, attempted). However, this patent (# 26,424) apparently prevented Knutsen from designing and building his own harp mandolins until 1910. This is pretty interesting! One Claude Gaskins received a patent (# 552,116) for his "mandolin-harp" on Dec. 31, 1895. Was Knutsen aware of it? Possibly not, as Gaskins was in Pennsylvania. This one would also seem to have prevented Knutsen from building his harp mandolins for 14 years. Click here for Patent text and similar "harp-violin" patent. What then to make of this one? Patented (# 52,539) by one George J. McVey of Lincoln, Nebraska on Oct. 8, 1918, it's clearly a knock-off of the harp-mandolins Knutsen had been building since about 1910. 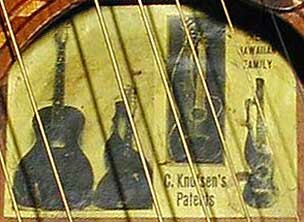 Knutsen's labels also claimed his mandolin was patented, though there is no record yet found of this. So how did McVey manage this Design Patent? He boldly claims his "new, original, and ornamental Design for Musical Instruments." For some reason, the term of this patent is only 3-1/2 years. This patent (# 45,566) was granted April 7, 1914, and was again, "a new, original, and ornamental Design for Musical Instrument" by Catello Longobardi, of Schenectady, New York. Notice the tuners, again similar to the Schenck guitars. This is a variation on the existing European mandolins (shown below), with a unique small bowl added to the back. If you enjoyed this page, or found it useful for research, please consider supporting Harpguitars.net so that this information will be available for others like you and to future generations. Thanks! All Site Contents Copyright © Gregg Miner, 2002, 2003, 2004, 2005,2006. All Rights Reserved.